You might have to reverse bay park on your driving test. Here is a rough guide to the 45 degree method. You're allowed to use this technique on your driving test. 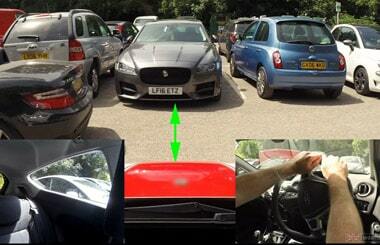 Reversing into a bay is safer than driving forward into one as you'll have a better view when driving forward out of it, especially if you have vehicles either side of you. There's not much room for error when parking in between cars but on your driving test you'll probably do this with empty bays either side. In this example I'm parking in the bay marked with a white arrow. Driving over to the left towards the bay will make it easier to then turn and reverse into it. Before that, check your mirrors and over your left shoulder first in case there's someone going past you. As with all potentially tricky manoeuvres it's important to drive slowly to make it easier and safer. There's lots of hazards in car parks including pedestrians, cyclists and other drivers. Drive past the target bay slightly and get the car straight. The picture on the left shows when to steer right, maximum, full lock. After turning right, the back of the car will then be pointing towards the target bay. I've lined up my left hand, nearside mirror with the centre of the bay that's next to the one I want. 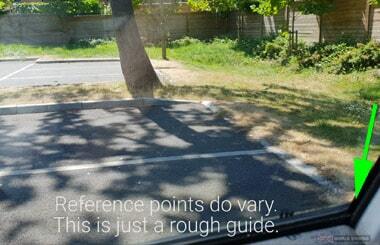 I'm driving a 3 door Ford Fiesta and this reference point works for me but bear in mind that reference points vary depending on the car you're driving, your height and seat position. Before steering right, check that no one is driving, walking or cycling past on your right. Steer full lock, maximum to the right to roughly get a 45 degree angle, it's not precise. Steering a little left before stopping helps make the next reversing part easier. 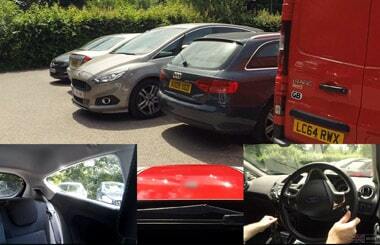 Stopping close to the bays in front gives you more room to reverse and steer. Good observations are so important. Check all around before reversing. As you reverse, steer full lock to the left. It's really important as you do any reversing manoeuvre to keep observing around and over your left shoulder out of the rear window to make sure it's safe. 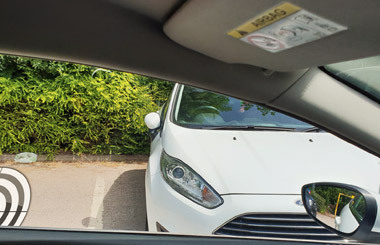 You are allowed to move your side mirror down a little if needed to see how you well your parking is going but it's essential that you don't stare at it. When to straighten the steering. Straighten the steering to the right and reverse straight once you can see the front of the car running parallel with what's ahead. Stop when the line behind or kerb disappears into the car over your right shoulder (as shown in the picture). You might have to stop a little earlier if there's something sticking out in your way. You are allowed to open your door to check if you're in the bay but only open it once you've made sure that no one is driving into the bay next to yours. If you're not in the bay then you can drive forward to re-adjust and then reverse back in as long as it's safe and you're observing for others before and as you do it. You might get a driving fault for this or a minor as they're commonly called. 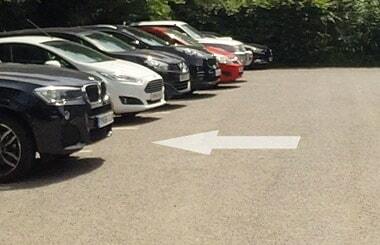 How you correct your parking depends on which line you've parked over. Having your side mirror adjusted down slightly will help you see the white line but don't stare at it and keep looking around for others who might be nearby.